Anything to do with Hunting and Shooting ! 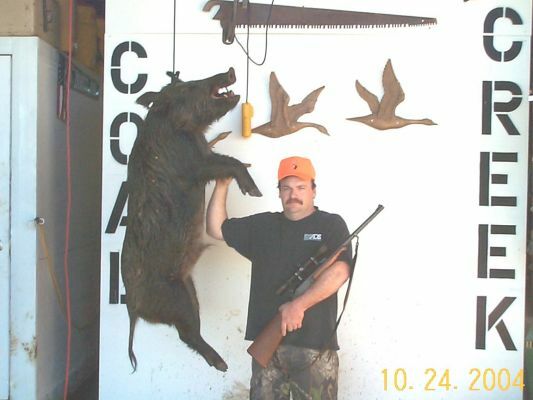 This hog was taken in Oct. 2004, weight is 250 lbs. I used an H&R handyrifle in 45/70 govt. The only differance is I am a Black Powder Cartridge loader. The round is 45/70 with 510 grn. round nose lead bullet (Lyman 457125 ), 0.30 card wad between the powder and bullet, 65 grn. Pyrodex Select black powder, a Winchester case and Std. Large rifle Primer.